Police in the city of around 300,000 said it had caused “major infrastructure damage”. 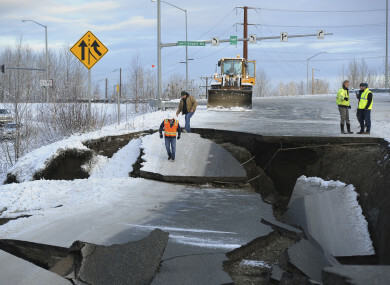 The on-ramp to Minnesota Drive in Anchorage, Alaska shows the effects of the morning's earthquake which caused extensive damage to the local area. A POWERFUL EARTHQUAKE rocked Anchorage today, violently shaking homes and businesses, sending scared residents into the streets and damaging buildings in Alaska’s largest city. The 7.0-magnitude quake struck at 8.29 am local time (5.59 pm Irish time), in the middle of the school run and as workers were heading out for the day. The US Geological Survey said the epicentre was about eight miles (13 kilometres) north of Anchorage at a depth of 25 miles. Residents posted pictures and videos to Twitter of damage to their homes and stores – belongings knocked off of shelves, broken windows and pictures scattered on the floor. Local CBS affiliate KTVA posted a video of a room shaking back and forth with panels falling from the ceiling and lights flickering on and off as people hid under desks. “It’s winter. It’s cold. It’s dark. And we’re not sure what the power situation is,” Murkowski said. We’re worried about breaks in gas lines. ENSTAR Natural Gas company asked residents to beware of gas leaks while the main water company said there had been water main breaks. About two-and-a-half hours after the quake, Municipal Light & Power said approximately 7,000-10,000 customers were still without power. The company said there was no damage to electricity generation infrastructure. The University of Alaska announced it was closing for the day. “All non-essential personnel should go home,” it said in a tweet. In an audio recording posted online, an air traffic controller could be heard telling a FedEx cargo plane to go around – abort its landing – as the quake hit. The Anchorage School District told parents to come pick up their children “when you feel it is safe to do so”. The Trans Alaska Pipeline, one of the longest crude oil pipelines in the world, was shut down as a precautionary measure so crews could inspect the system. Alaska was hit by a 9.2 magnitude earthquake in March 1964, the strongest ever recorded in North America, which left 139 people dead. Email “'Many homes are damaged': Powerful 7.0 magnitude earthquake hits Alaska ”. Feedback on “'Many homes are damaged': Powerful 7.0 magnitude earthquake hits Alaska ”.